JAXA | Masaru Wada, Associate Senior Engineer "A Bridge Connecting Humans and Space"
Masaru Wada, Associate Senior Engineer " A Bridge Connecting Humans and Space"
The JEM Small Satellite Orbital Deployer (J-SSOD) deploys small satellites from the airlock of the Japanese Experiment Module Kibo on the International Space Station. Small satellites, which can be developed by private industry or universities, are expected to pave the way for new forms of space exploration and utilization. — Please tell us about the JEM Small Satellite Orbital Deployer. Let me briefly explain about the mission: Small satellites are set in Satellite Install Cases, and delivered to the International Space Station (ISS) by a cargo transfer vehicle such as Japan’s H-II Transfer Vehicle KOUNOTORI. Then, using the airlock and the robotic arm of the Japanese Experiment Module Kibo, the cases are transferred into the space environment, ready for the satellites to be deployed into Low Earth Orbit. The cases hold three satellites each, and one airlock mission can deliver two cases into space. 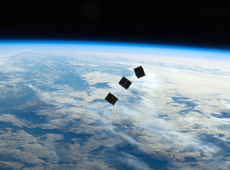 So in one day, we can deploy six CubeSats, which are 10cm-cubic mini-satellites. — Is this an original Japanese system? Yes, it is. 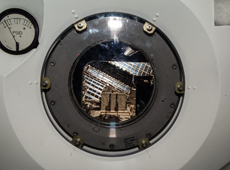 Only Kibo has the airlock, which is used to move hardware in and out of the space station. So that’s the only way to deploy small satellites from the ISS. Also, Kibo has the Multi-Purpose Experiment Platform (MPEP), which is specifically designed for moving hardware out of the ISS through the airlock, using Kibo’s robotic arm. After the Satellite Install Cases are delivered to the ISS, they are first installed on the MPEP and placed in the airlock. 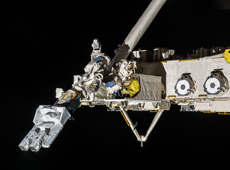 Then the MPEP is moved into the space environment, and Kibo’s robotic arm captures and puts it into position, facing backward and down at a 45-degree angle. A remote command opens the lid that holds the satellite in place, and a spring is used to push the satellite into space. This system is so simple that a malfunction is unlikely. 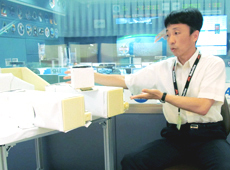 — I have seen video of Astronaut Koichi Wakata deploying a small satellite. But the command can be issued from the ground, too, right? A command to deploy the satellite can be issued either by an astronaut on the ISS or from the ground. 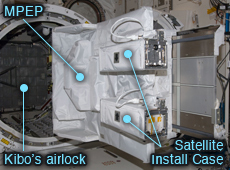 You need an astronaut to place the cases on the MPEP, but once the MPEP is transferred out to the exposed space, the astronaut’s presence isn’t essential. The robotic arm can be controlled from the ground. — How many satellites have been deployed from Kibo so far? The first ones were deployed into orbit in October 2012 – three Japanese and two U.S. satellites. Akihiko Hoshide was the astronaut who commanded the deployment. 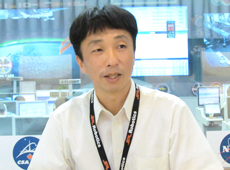 The next mission was carried out in November 2013, with Astronaut Wakata commanding. Four satellites were released then: three U.S. and one Vietnamese. The Vietnamese satellite was developed in cooperation with the University of Tokyo and IHI Aerospace, and JAXA provided full engineering support for its deployment from the ISS. Kibo’s satellite deployment technology has also been used by the U.S. private sector. 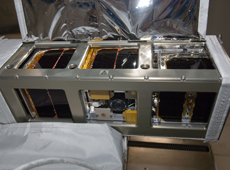 In February-March 2014, 33 CubeSats were deployed using satellite deployer manufactured by NanoRacks LLC. We believe that foreign companies entrust us with their satellites because they have confidence in Japan’s satellite deployment system. — Typically small satellites are piggybacked on rocket launches for bigger satellites. Also, Russian cosmonauts released a small satellite while doing a space walk. What makes JAXA’s J-SSOD system special in comparison? There are three advantages. First, the vibrations during launch are less harsh than during a rocket launch. (For transport to the ISS, our small satellites are stowed in a soft-cushion bag.) Second, J-SSOD provides more launch opportunities, because satellites can be manifested not just on the HTV but also on other countries’ cargo vehicles. And finally, once the satellites are delivered to the ISS, the astronauts can check them for any damage they may have suffered during the flight from Earth. That gives the mission a higher chance of success. If the launch vibration is lower, satellite design should be relaxed too. For example, the weight and volume of structural parts will be reduced if the thickness of the structure can be reduced thanks to the lower stress. There are strict restrictions on the weight and size of a CubeSat. If we can reduce the weight and size of the structural parts, this will give satellite developers more space and flexibility in the way they design the satellite. This can reduce the cost and time required for satellite development, too. Another advantage of the J-SSOD system is that it doesn’t require EVAs, or space walks. During EVA, astronauts may face to fatal risks, such as being hit with space debris. We want to minimize the risks to astronauts as much as possible, so I think it’s better to leave such hazardous tasks to robots or other mechanical systems. — How was the mission conceived in the first place? It came out of our desire to increase the number of Kibo users. The idea came under review two years before the first mission in October 2012. At that time, we were bouncing around ideas for missions that would allow us to use Kibo to acquire new technology. Meanwhile, globally, there was growing demand for small satellites, and as a result many small satellites were awaiting launch. 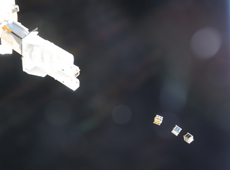 We thought that Kibo would be able to provide a solution because it is the only facility that has both an air lock and a robotic arm – a combination that allows the deployment of small satellites. I think JAXA’s J-SSOD mission gathered attention because it met their demand so perfectly. — It was developed quite quickly, wasn’t it? Actually a college in the United States was already developing a device for deploying CubeSats, and we utilized that concept to fit Kibo. We didn’t have to start from scratch, so we were able to minimum the time and cost of development. — How do you decide the timing of satellite deployment? We coordinate the timing based on requests from users, but certainly satellites cannot be released when the Soyuz spacecraft or a cargo vehicle is approaching or leaving from the ISS, in order to avoid any chance of collision. Also, if a satellite is scheduled for launch by rocket around the same time, we have to make sure that small satellites will not interfere with its orbit. Requests are also made from an organization in the United States that monitors space debris. There are restrictions about the number of satellites that can be deployed and the intervals between deployment, in order for them to be able to recognize and track even a small satellite like a CubeSat. So if our satellite deployment is postponed due to some kind of problem, we cannot just try again the next day. — Is the satellite selected by public offering? The satellite deployment program provides free-of-charge launch and paid launch. For a free-of-charge launch, when we receive an application from an organization – such as a private company or a university – we look at the project’s contribution to the expansion of space utilization and to human-resource development in the field, and we judge the value of the mission from the viewpoint of national benefit. Satellites selected on this basis are entitled to complimentary launch. As for paid launches, in contrast, those can be for a commercial purpose as long as the satellite meets our requirements, including safety. You can check the website of JAXA’s New Enterprise Promotion Center for more details. — Will Japanese Satellite Deployer be modified to hold more satellites like the American ones? At this moment, we are not planning to modify the cases for CubeSats. In our opinion, we, JAXA, made achievement by proposing and validating a new way to utilize the ISS. Satellite developers were impressed with our technology, and as a result, American users, including NanoRacks, started using Kibo. This is a great accomplishment. Besides, our method – launching a limited number of satellites with dedication and courtesy – reflects our Japanese character. Taking larger satellites into account, we are also working on ways to deploy 50-cm size satellites using the same system. — What do you think is the main selling point of the J-SSOD system? I mentioned earlier that the NanoRacks deployer released 33 small satellites. Our first mission was carried out in October 2012, and the United States immediately developed a new, bigger satellite deployer. Now their satellite deployer can hold as many as 48 CubeSats. They launched just 33 this time due to the size of the satellites, but I would say it was still a daring mission. Japanese engineers are diligent and earnest, and we try to follow the requirements thoroughly for the interface we offer, but Americans have the boldness to break barriers and say, “Such-and-such requirement doesn’t work for us, but how about this instead?” Under such circumstances, it may be difficult for us to compete with foreign countries just on the basis of our satellite deployer. So when I think about Japan’s selling point, it seems to me that it is our end-to-end, integrated service, from reception of satellites to deployment, offering engineering support along the way, and as a result giving our users a sense of security. We can tell users with confidence that they can trust and depend on us. Excellent support is guaranteed, because we Japanese are diligent and earnest (laugh). — What made you decide to work in the space sector? Were you interested in space when you were a child? I wasn’t particularly interested in space as a child. I grew up in Ogaki, Gifu prefecture, and I was just an energetic child who would come home from school and immediately run to play outside. I wasn’t good with mechanism either. I was just a country boy with not much distinctive character (laugh). But I do recall that I was wowed watching the first flight of the U.S. Space Shuttle on TV. When I think back, that might be what inspired me. But later I didn’t head straight towards a space-related job. When I was studying aerospace engineering in university, I still didn’t have a clear vision. After thinking hard about where to work after graduation, I decided on an automobile company, but my interest in someday working in the space sector remained. And later, I had a chance to work in the United States as an expat, and as I interacted with aerospace experts there, I realized that I wanted to work on sending people to space in my lifetime. This is how I decided to work at JAXA. I really wanted to contribute to the creation of an era where ordinary people can travel between Earth and space. — Do you dream of making a Japanese manned spacecraft? I would say so. It may be a dream that’s hard to realize, but I am hoping that someday Japan will be able to run a human space program on its own. I really would like to achieve manned space transportation with Japanese technology. When it comes to making a domestic manned spacecraft, I personally think that it’s not useful to take long time in discussing which organization should take responsibility or leadership. I think it’s possible to build a manned spacecraft with technology Japan has today. If it’s possible to get consensus from the government, JAXA and the public, the project could start right away. To make it happen, I would like to make Kibo more available to users, so that the public can become more familiar with space. — How often do you plan to conduct J-SSOD missions in the future? JAXA would like to offer launch opportunities to as many people as possible. Earlier this year we put out a call for applications for paid launches. We already have some applicants, and we’re expecting that the number of users will continue to grow. Regardless of whether we use Japanese or U.S. satellite deployer, we are hoping to deploy satellites from Kibo at least twice a year. — Where do you want to see the mission go in the future? I think future missions will use technology that allows us to use remote-controlled robots to do jobs in space. This could lead to a manned mission to Mars. My first goal is to achieve the deployment of satellites with a size of 50 cm, but at the same time I would also like to pursue other potential missions that use Kibo’s airlock and robotic arm. I am sure that this experience will be useful for future space exploration. At the same time, as with the Vietnamese satellite we deployed, I would like to make the J-SSOD mission more available to countries that are new to space exploration. — Finally, could you tell us about your vision for the future? Through the J-SSOD mission, I’ve had an opportunity to work with many people – not just NASA staff but also people at private companies in the United States and Vietnamese engineers. By listening to and accommodating their requests, we have been able to create new ideas and technology, as well as building good relationships with them for future projects. I would like to continue to work with our users to expand the potential of the J-SSOD mission. In addition, a small satellite is relatively easy to develop, so I recommend it as the first step to space. I hope that the J-SSOD mission will serve as a bridge connecting humans and space. Mr. Wada graduated from the School of Engineering at the University of Tokyo. 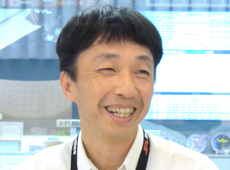 After working for an automobile manufacturer, he joined JAXA in 2000 and was involved in development of the Japanese Experiment Module Kibo, its launch-site operations, and its assembly in orbit. He was later assigned to safety assessment and supervision of satellites (including mini-satellites) and rockets, as well as in the field of aviation. He is currently working on user support for projects done in Kibo’s exposed facility, and on technical support for system operations. The JEM Small Satellite Orbital Deployer (J-SSOD) mission is one of his main responsibilities.